Early birthday presents await in Asuncion? 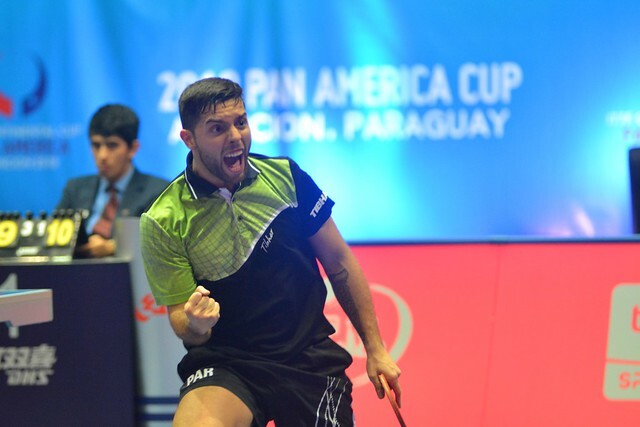 Runner up earlier this year at the Seamaster 2018 ITTF World Tour Qatar Open in Doha, Brazil’s Hugo Calderano is the top seed in the Men’s Singles event at the forthcoming 2018 Pan America Cup. Play commences in Asuncion, Paraguay on Friday 15th June, exactly one week before the young man who hails from Rio de Janeiro celebrates his 22nd birthday. Currently listed at no.11 on the Men’s World Rankings, Hugo Calderano has raised the bar for not only Brazil, also for Latin America and for the whole of Pan America. Now the intriguing question is as to whether Kanak Jha of the United States, four years younger than Hugo Calderano and presently listed at no.72 on the Men’s World Rankings can emulate the Brazilian and reserve a place amongst the very elite of the sport. Moreover, can both gain places in the forthcoming Liebherr 2018 Men’s World Cup to be staged in October? However, the situation is not as last year when each continent was eligible for place in the prestigious global tournament, in Asuncion, it is the winner and runner who qualify irrespective of continent. The no.3 seed, behind Gustavo Tsuboi, also from Brazil and the winner one year ago in Costa Rica, Kanak Jha is the leading name from North America. Also could he be in line for an early birthday present? He celebrates his 18th birthday three days prior to that of Hugo Calderano. Memorably, in Costa Rica, in the group phase of proceedings he beat Gustavo Tsuboi and in Asuncion is the one player from north of the border who appears amongst the top quartet. The host nation’s Marcelo Aguirre completes the top four names but although he has three Olympic Games appearances to his credit he is the odd man out; he is only member of the group not to have competed in a Men’s World Cup. Gustavo Tsuboi played in 2011, 2015 and 2017, Kanak Jha in 2014, Hugo Calderano in 2016. Play commences with the initial stage comprising four groups, three players in each groups. Players finishing in first places advance to the quarter-finals, the stage at which the top four names – Hugo Calderano, Gustavo Tsuboi, Kanak Jha, Marcelo Aguirre – enter the competition.